Safe and Effective for all pets 5 pounds and up. Features the Deluxe Ultralight Receiver with Five Levels of Adjustable Correction.� Perfect for any yard up to 25 Acres. The best, most advanced dog fence on the market today. Features the Deluxe Ultralight Receiver with five levels of programmable correction. This Deluxe Dog Fence does not include Wire and Flags. Five levels of Programmable Correction. Level one warning tone only - ideal for initial training or very timid pets. We recommend you get extra batteries with your order. initial system set-up and pet training will create more drain on the batteries than normal. Typically the batteries included with the receiver will need to be replaced after 30-60 days. Battery life under normal usage averages 4-6 months. The Deluxe Ultralight Receiver uses battery module RFA-67D-11. 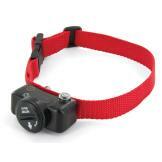 The Ultralight Receiver is for any dog or cat that is over 5 pounds.�4 levels of correction.